Do Amish have genetic disorders? Some Amish and Mennonite individuals struggle with genetic conditions little-seen in the general population. Certain Amish populations also exhibit diseases and conditions seen elsewhere, but at a higher rate than the general public. Amish and related groups have been assisted by outsiders in treating genetic problems. What genetic diseases are common among Amish and Mennonites? 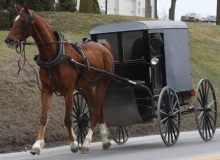 Amish and Mennonites exhibit certain rare diseases uncommon in other populations. These include Ellis-van Creveld syndrome (a type of dwarfism), glutaric aciduria, Crigler-Najjar syndrome, and maple syrup urine disease. Some illnesses are so uncommon that they are unique to these communities (such as Troyer Syndrome or Amish lethal microcephaly), or rarely seen elsewhere. Some groups of Amish may exhibit diseases more likely to be seen in the general public, but at a higher rate. These include cystic fibrosis, muscular dystrophy and deafness in some communities. Small founding groups-individual Amish communities typically originate from relatively few families. Almost all of the Amish in Lancaster County, for example, originated from a few dozen 18th-century immigrant families. Genetic isolation-converts to the Amish have been rare, and Amish only marry other Amish. This practice of endogamy, with few new bloodlines entering the population, has led to limited variation of genes. These two factors combine to create a “founder effect”. A founder effect means that genetic variation is lost over time due to a limited number of founding individuals. Certain recessive traits found in a small founding population are amplified in future generations. Amish face a particular challenge. The Amish way of life and culture, requiring members to restrict use of technology, live in a generally austere manner, and master a specific dialect for worship and day-to-day communication, makes it particularly difficult for non-Amish to join the Amish church. Additionally, most Amish tend to focus religious energies on their own sizeable families, as opposed to proselytizing others. These two factors make it unlikely for outsiders to join the Amish, a process by which the Amish genetic pool would otherwise be deepened over time. Amish and outsiders sympathetic to their challenges have focused on early diagnosis and treatment of genetic illnesses in their communities. A number of institutions assist Amish and Mennonite families afflicted by inherited genetic disorders. 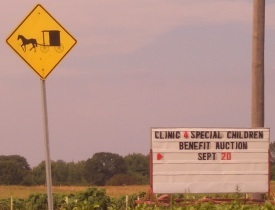 The best-known is The Clinic for Special Children, located in Strasburg in Lancaster County. The Clinic, run by Dr. Holmes Morton, operates thanks to contributions, proceeds from annual benefit auctions taking place in Pennsylvania and Ohio, and by charging relatively small fees for services. The Clinic for Special Children also treats children from outside the Amish and Mennonite community and from around the world. Other medical institutions, such as the Akron, Ohio Children’s Hospital and the SUNY Upstate Medical University accommodate Amish and Mennonite patients, as in the case of cystic fibrosis treatment, for example. Researchers fairly frequently enlist Amish help in conducting genetic studies, such as recent research on the presence of a “fat gene” in Amish individuals. Amish, increasingly aware of the benefits genetic research can bring to others and themselves, generally participate in large numbers. Intermarriage across Amish society may be another solution to genetic issues, as Amish in different communities exhibit different bloodlines. However, differences in practice between Amish affiliations may prevent such intermarriage from occurring. Marriage between communities such as Lancaster County and Holmes County, Ohio, occur only rarely. 9 responses to Do Amish have genetic disorders? I am doing a research paper on Amish genetic disorders and was wondering if there was more to the article listed above, or if you have nay more inforamtion regarding this topic. If you could contact me, I would appreciate it greatly. I can also be reached by phone at 302-690-4427. Thank you for your time. In over 25 years living in an Amish community, I’ve witnessed a distressing and frightening array of genetic disorders among the children. Recently, however, I attended a presentation by a snake oil salesman who could have come straight out of a Gunsmoke episode. He insisted none of the maladies afflicting the children or others are genetic. He claimed they’re all caused by dietary deficiencies. It was a throwback to the dark ages. If they bought his “nutrition supplements” then it would cure epilepsy, muscular dystrophy, downes syndrome and impotency, among others. He is misleading people and will injure them. Whats to be done with this fraud? Has there been any effort toward education regarding the claims of the “snake oil” salesman? So many times people (or their families)who have been affected by a disorder that they cannot personally control are vulnerable to anything that comes along that feel gives some measure of managing the problem. Considering the practices of raising families inside a very small gene pool, it is a certainty that the incidence of these disorders will increase. Maybe it is that the genes predispose a person to some disease . It maybe that good nutrition will help to prevent that disease . if the person prescribing the snake oil has a history of cures . I’d give it a try if it is getting results . Is there proof that these supplements wouldn’t work? Perhaps not for some of these conditions, but other supplements have been well known to help aid a body to cure itself of a disease, such as cancer, Fibromyalgia (I hear a rising occurrence among the Amish), MS, Diabetes, etc. Remember that these supplements (if a good quality) may very well be those vitamins and minerals that we are lacking in modern diets, and the Amish diet in many places can be lacking, though I know many are as concerned about mainstream diets and their deficiencies. We have a doctor in Colorado who is primarily homeopathic but has his medical degree. He has a very high success rate using supplements and raw foods/juices to rid the body of cancer and other ailments, such as Fibromyalgia. And supplements and essential oils are all natural medicines given to us by God and largely overlooked by the population at large. Something that may appear to be “snake oil” to some, may very well be exactly what is needed. I don’t know the individual persons, so I can’t really comment on that. Recently, a purdue study showed that the fruit of the Soursop (graviola) tree killed cancer cells 10,000 times better than chemo drugs. Why is it not known? It could never be synthesized. They tried for seven years. The snake oil salesman is a crook and is dangerous. He is a false prophet. Significant numbers of children in Amish communities die of what is now a well-known disease, first identified during the 1930’s. Even during the 1960’s, before the advent of the astounding genetic research that has been accomplished over the last 30 years, it was known to be a genetic disease. It appeared in some families from Northern Europe, while others from there were free of it. Genealogical research on its own revealed the disease does not necessarily occur every generation, but can skip several generations before striking again. It has nothing to do with diet or dietary deficiency. Well-fed children on healthy diets from families using vitamins, get it regardless. It is the pattern of paternity. Many children die in infancy, and most die by their teens. There are a wide variety of treatments for those children though, that have proven effective over the decades, which can keep them healthy, and help them live longer, at least into their 20s and 30’s. Some of the treatments cost no money, but only time and consistency, furnished by loved ones. Other treatments in the struggle for health and life cost very little. Newly developed treatments can be costly. Regardless, at whatever level the parents are able to administer these treatments, the afflicted child will live a longer, healthier, happier life. However, if uneducated parents are seduced by the easy answers and false assurances of the snake oil salesman, who assures them those children do not have the genetic disease, the parents fail to administer the proven, time-tested treatments vital to the children’s health. Instead, the parents pay princely sums of money, automatically deducted each month, into the accounts of the snake-oil salesman. He provides them jars of his costly material (which he may dig up in his own back yard). There is no inspection or certification that his material is even what he alleges it to be. He skirts the law. He avoids the light of truth, engaging in all manner of measures to escape questions by the authorities. Even in his sales meetings, if someone raises a point he does not want discussed, he buries it with bombast. If the pilgrim persists in raising the uncomfortable truth, even calmly and logically, the snake-oil man has his bouncer throw the truth-seeker from the site. What is the consequence? The children are denied the time-tested treatments proven effective against their disease. Instead, they are fed material, regardless of what it is, that will not even slow the development of their disease. Innocent children die needlessly painful, early deaths. Thanks to the snake oil salesman. Educating the communities would help. Amish, though, spend their lives in fear, or apprehension, of many things. Disagreement is often one of them. Its frequently easier to go along and get along. My experience with the uber strict Swartzentruber Order has witnessed married cousin couples. This order allows intermarriage. Consequently, I’ve met those with dwarfism, bipolar disorder, depression (can be genetic), physical challenges, etc. Our son-in-love left the Swartzentruber order for many reasons. He told us that one of those reasons was that he feared marrying another Amish gal and having children with genetic disorders due to intermarriage. Yes, for the most part, these People are aware of the problem and often will relocate to another settlement in an effort to bring in “fresh blood” to new marriages. I asked Erik if I might refer to a blog post in relation to this topic but, haven’t heard back from him yet. I write a blog about the Amish, with emphasis on the least-known Swartzentruber Order, and I penned a post about the genetic problems. Oops, my bad, forgot to post my name to the ^ previous comments. Hi Brenda, just circling back to this comment, I know I emailed you already, but if you’d still like to feel free to share it here. This has to be a hard issue for some, one that most of us fortunately don’t have to worry about. Swartzentruber Amish people seem to have an attitude of accepting “whatever God wills” more than just about any other Amish. So it would be interesting to learn that they are in fact proactive about trying to prevent this type of situation. Leave a reply to Do Amish have genetic disorders?